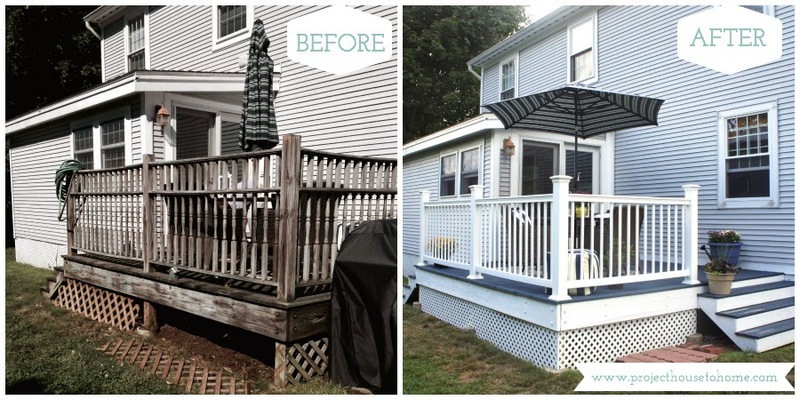 Our DIY deck makeover is finally complete (and we lived to tell!). 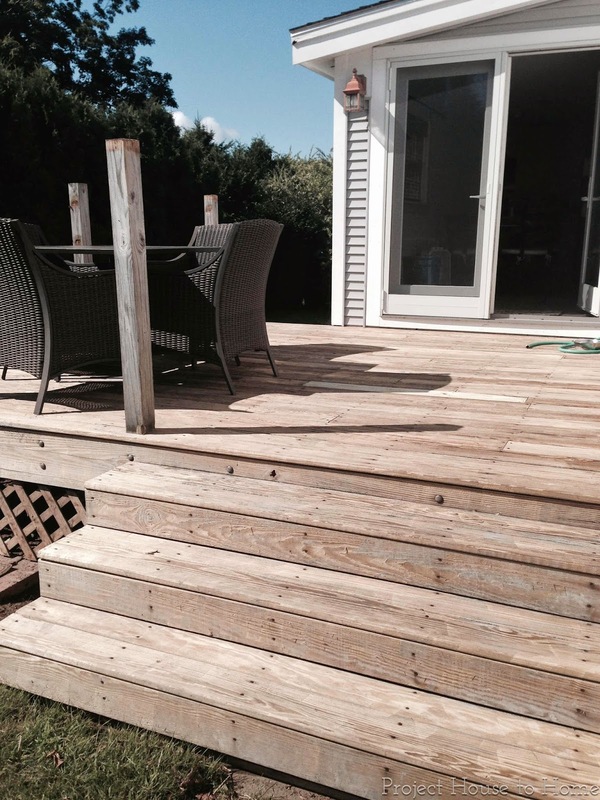 The deck was looking pretty weathered. It hadn't been stained in years (maybe ever? ), the wood was starting to rot and splinter and the rails were bowing. 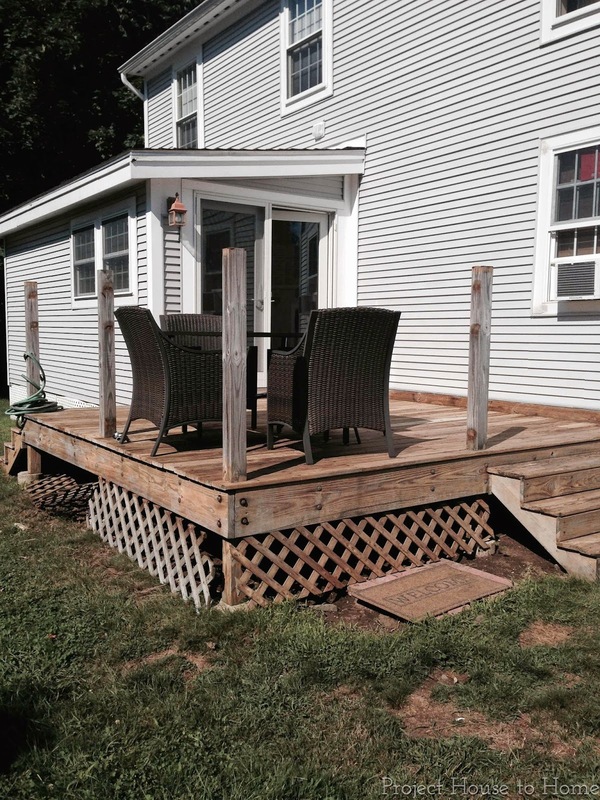 We wanted to give the existing structure a facelift without spending too much money. 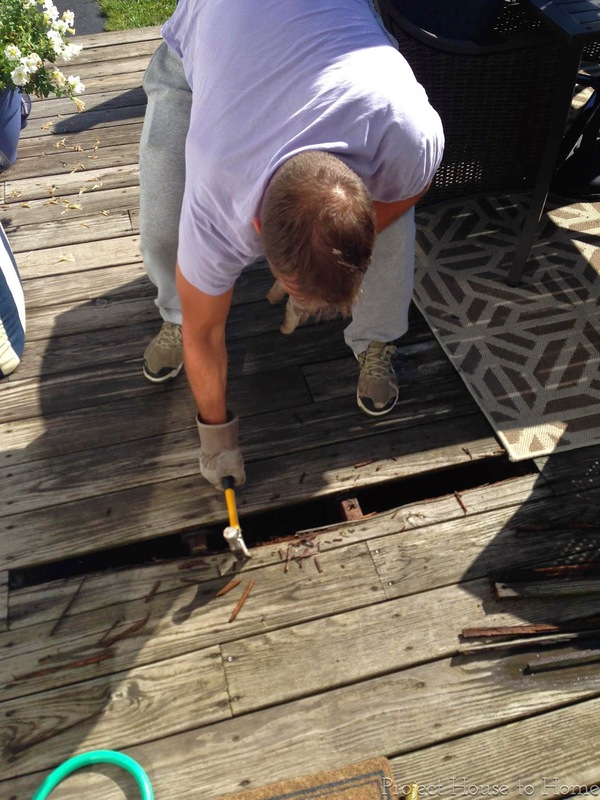 First, Matt replaced some rotted boards. 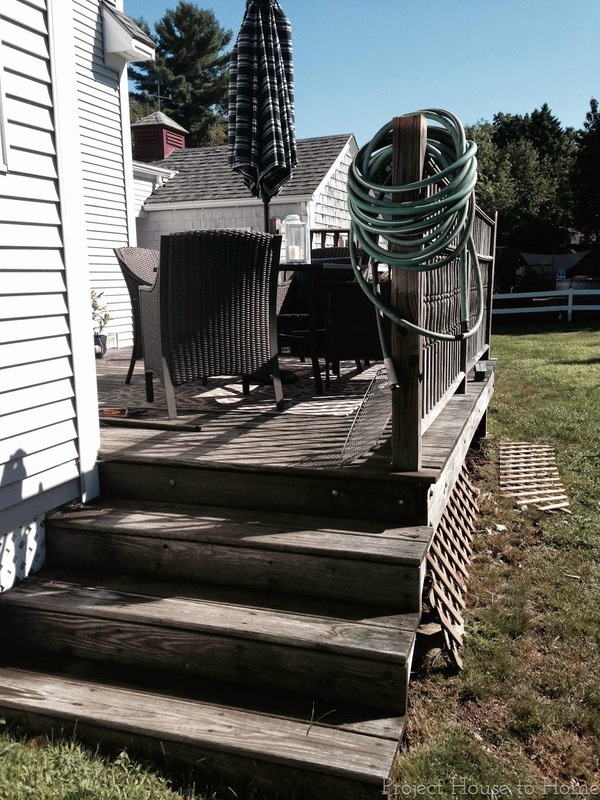 And then he pressure washed the deck and removed the old rails. 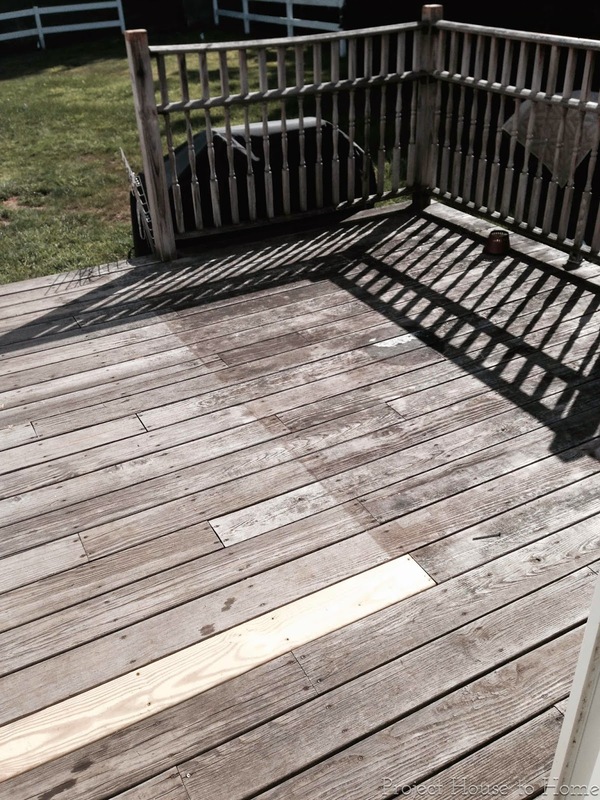 We had to wait a week for the deck to dry out before we could begin painting. 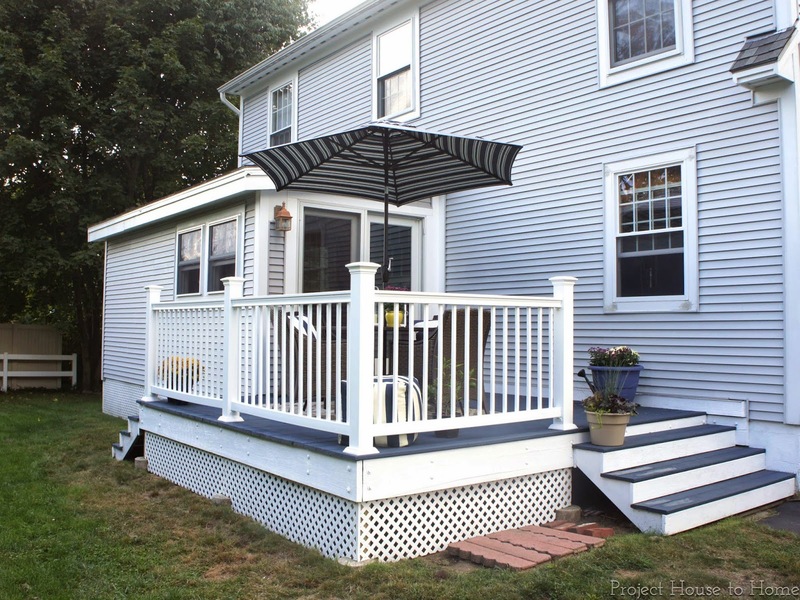 Matt's family had used Behr DeckOver with success so we thought we'd give it a try ourselves. 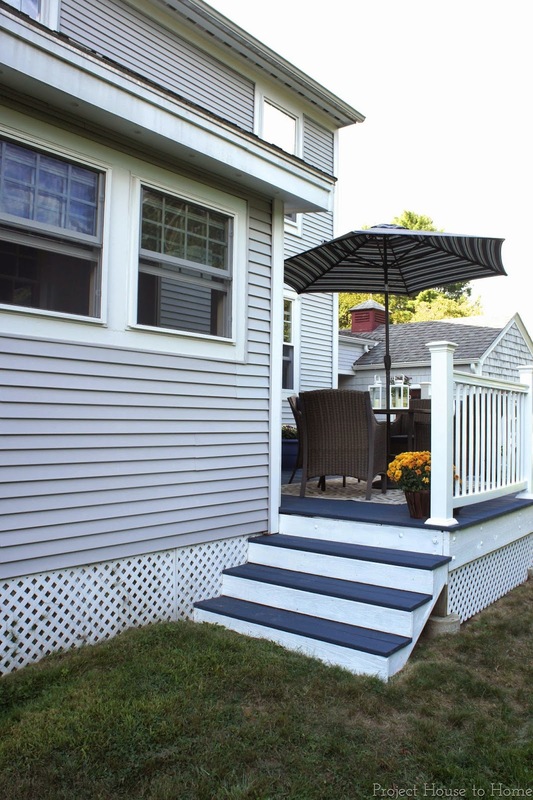 We chose "Atlantic" for the color which gives it a really nautical look, but living in Maine, it's perfect! Matt rolled on two coats on the deck. The paint is super thick, but it does a good job of filling in cracks. I took a very small paint brush and painted the cracks between the boards. That was probably the most time consuming part of the project. 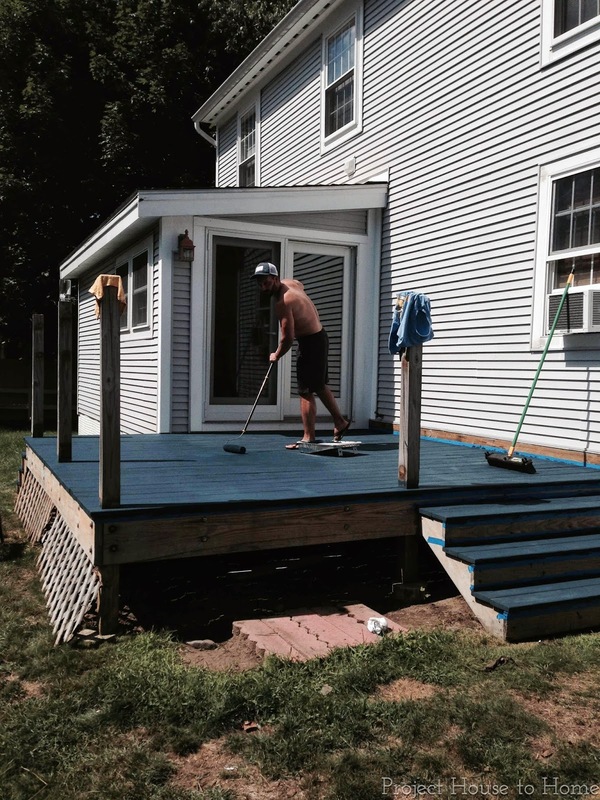 I was a little afraid the deck was going to end up looking like a giant Smurf and I'll admit there was a moment after we painted it that I was really worried, but there was no turning back. I decided to paint the trim, and risers white to give it some contrast and I love it! I just used regular outdoor paint for the trim and risers, so I'll be interested to see how it holds up. Instead of painting the exiting rails we decided to replace them. 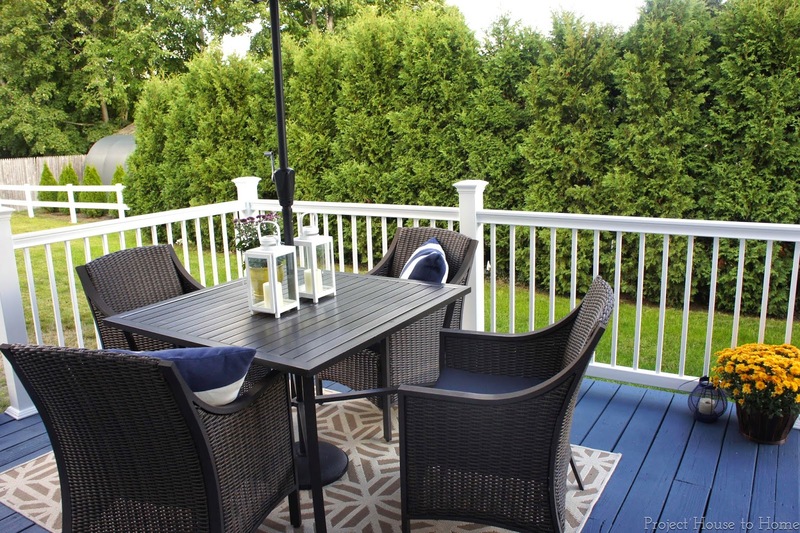 We bought pieces of the Veranda pre-built rails from Home Depot. 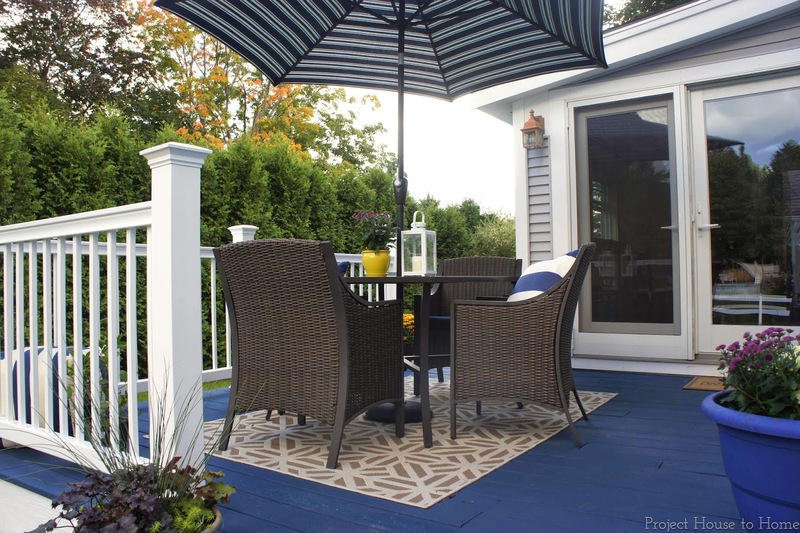 They are made of vinyl and are virtually maintenance-free. We used the existing four posts and covered them with vinyl post sleeves and caps then secured the pre-built rails in between them. We had to do a lot of measuring and cutting to get everything to fit right. A compound miter saw was our best friend for this project. It took us some time to get a system down for measuring, making the cuts, and installing and this part of the project took us an entire day. If we had to do it again, I'm sure we could do it much faster second time around. 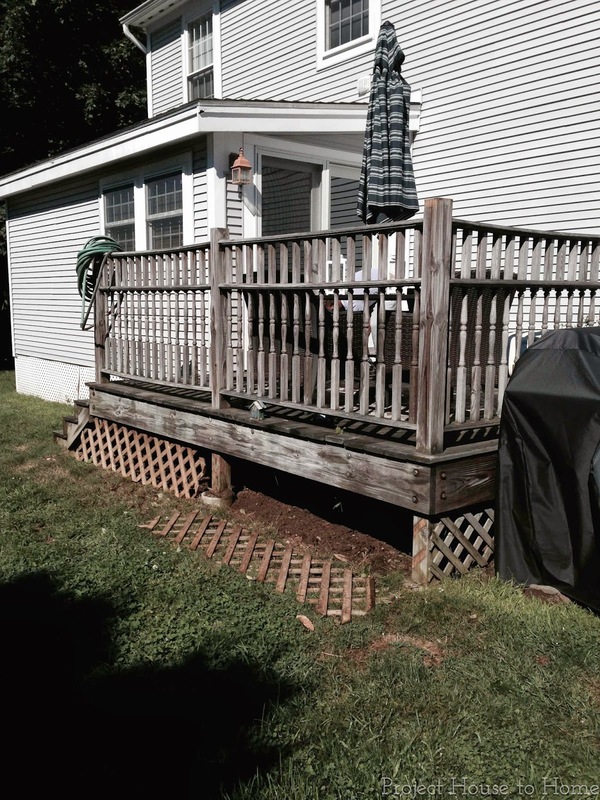 We also replaced the lattice around the bottom of the deck. One large sheet was enough to cover the perimeter. We're very happy with the results and the whole project (including supplies) only cost us about $600. Wow! What a transformation! It turned out gorgeous. I love the dark blue (and no - I did not think "Smurf" when I first saw it) it's the perfect nautical look for your house. Did you paint the house too? Haha, thanks Sharon! We didn't paint the house though I do see how the color looks a little different in the photos - probably a different time of day. The house is light gray but it has a slight blueish tint to it. 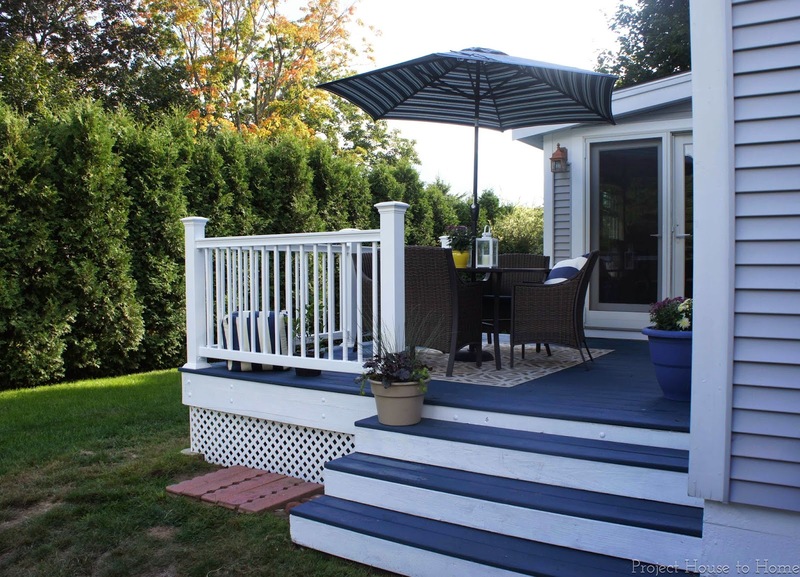 Do you happen to remember the Deck Over Behr Paint Color you used? I love that blue!